When I began doing oral history interviews at the Smithsonian in 1974, I went to see Louise Daniel Hutchinson (1928-2014) of the Anacostia Neighborhood Museum, now the Anacostia Community Museum (ACM). She was a pioneer in community oral history and experimented with new media, such as video, that captured settings and body language. She maintained the highest standards of scholarship at the same time that she welcomed the inexperienced, those outside the ivy-covered walls of academe. Her dedication to African American history was infectious, and she had a major effect on the development of the Anacostia Museum. Born in 1928 in Ridge, Maryland, Hutchinson’s parents were teachers and civil rights activists in the District of Columbia. As a college student, she sat-in at lunch counters and attended the arguments for Brown vs. the Board of Education of Topeka, Kansas. She received her B.A. from Howard University in 1951 and pursued graduate studies in sociology. She married Ellsworth W. Hutchinson, Jr., and worked as a substitute teacher as they raised six children. After the assassination of Martin Luther King, Jr., Hutchinson reassessed her life and decided she had to make more major contributions to improve the world for her children. As she was looking for an outlet, she was asked to take on an education project at the National Portrait Gallery that would focus on working with the District of Columbia public schools. 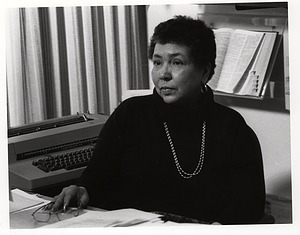 So in 1971 she became a researcher at the Portrait Gallery, working on the African American portraiture of William Harmon and Winold Reiss, with a goal of linking to the local community. She also contributed to the exhibit The Black Presence in the Era of the American Revolution while creating a solid program of educational activities. By that time, the Smithsonian was beginning to change a bit. 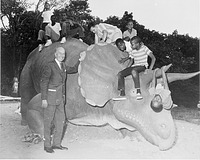 Secretary S. Dillon Ripley had created the Anacostia Neighborhood Museum in 1967 to reach out to the local African American communities that rarely visited the Mall museums. Community activist John Kinard was named director, and he brought Hutchinson to the Museum in 1974 to direct its Research Center. She quickly began a series of dynamic programs that engaged the community. The museum was housed in an old movie theater which a cadre of volunteers helped convert to a museum. The Anacostia Historical Society grew under her watchful eye, and she created a research center where locals brought their treasured bibles and photographs for preservation. Hutchinson curated several ground-breaking exhibits, such as The Anacostia Story: 1608-1930, Out of Africa: From West African Kingdoms to Colonization, and Black Women: Achievements Against the Odds. Meticulously researched, they were accompanied by books that made this history available to a broader audience. Smithsonian administrators had viewed the Anacostia site as a temporary exhibit venue to attract visitors to the Mall, not an actual museum. Hutchinson worked hard to redefine the museum's mission and eventually succeeded "against the odds" in making it a full scale museum. But she and her colleagues had to overcome significant inertia and even opposition on the Mall. The museum's Research Center collected a wealth of materials on African American history, including interviews of community members. She ensured that the contributions of the Anacostia and wider African American community were recognized in the historical record, and then shared that information with K-12 teachers and their students, community members, scholars and college students alike. She also rewrote Smithsonian history with her book, Kind Regards of S. G. Brown, on Professor Solomon Brown, the first African American employee at the Smithsonian who spent 54 years at the Institution. Hutchinson was always busy, but never too busy to mentor younger folks who needed guidance. Always generous with her time and expertise, Hutchinson placed the Anacostia Community Museum on a firm foundation and developed a cadre of young people to carry her work forward. Louise Hutchinson on the impact of the Martin Luther King , Jr. assassination on her work. Louise Hutchinson on working against all odds.